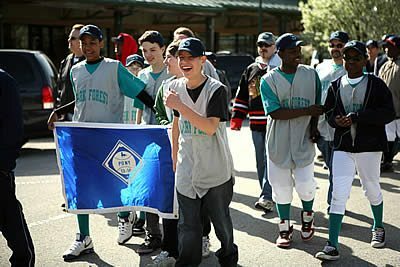 Park Forest, IL–(ENEWSPF)– The year 1950 saw the formation of the Park Forest Boys Baseball league, a Little League member. They played their inaugural season in 1951 and sixty years later the league is still going. There have been a few changes to the league, but its main objective of teaching both baseball skills and life lessons to the youth of our community is still the same. We are currently looking for contact information for any player, manager, coach, or volunteer involved in PF baseball during any time in its history. You can call 708-503-1944 and ask for Mary Kay or Aland or email the information to [email protected]. The temporary use of any picture or artifacts would be greatly appreciated. The league was originally called Park Forest Boys Baseball and began as a Little League member. PFBB was organized in 1950 and played its first season in 1951. That first year saw a total of four teams playing. This increased in 1952 to 12 teams and 36 teams in 1956. The year 1956 was a momentous year: PFBB incorporated and then withdrew from Little League in 1957. (It is currently part of the PONY organization: Protect Our Nations’ Youth.) It kept growing, as there were 48 teams in 1959 and 66 teams in 1961. What a growth in just 10 short years! During those years the league was helped out by the Park Forest Lions Club monetarily each season, but the bulk came from decal sales, an annual Merchant’s Drive, an annual dance, and voluntary contributions. It is obvious that the number of teams has greatly decreased since 1961, but it is encouraging to see our program begin to again grow. This growth is the largest in the Shetland, or T-Ball, division. In 2006 this division had a total of 21 players. However, through hard work and word of mouth, this division has grown to 6 teams of 11 each. Also, the minimum age was lowered to 4 year of age several seasons ago. Another major change for these youngsters is that they start seeing live pitching halfway through the season. This definitely has helped the players when they get to the Pinto league where the players pitch. This upcoming season has a total of 16 teams that will be playing. The 1961 season saw the league looking to acquire a clubhouse for storage. In 1990 the league built a building, in cooperation with Girls Softball and the Village, and it currently houses the equipment and things needed to launch a new season. The 2007 season saw the building of new dugouts in Central Park by the league, along with help from Prairie Material and the Village of Park Forest. The Village is also very instrumental in helping the season get under way. They allow us the use of Central Park, the use of the Village Hall Board room for registrations and uniform hand out, the use of Freedom Hall for Board meetings, help with maintaining the fields, and many other seemingly “small” details that are very much appreciated. The league has gone through many changes over the years. But one thing remains the same: providing our players with an enjoyable season. While they learn many baseball skills, they also learn life lessons along the way. It is the league’s hope that these young men and women remember the good times they had and the many hours volunteered to run the league. When they are parents we hope they will follow in these footsteps.